The thing about dystopian futures is that they can happen at any moment, in which case you'll want some accessories that both complement Australian motorcycle boots and intimidate feral children. Creating jewelry Mad Max would consider bad-to-the-bone, Rima Hyena. The after-hours project of a traditional class-ring jeweler with masters degrees in sculpture and metalsmithing, Rima's "Children of the Coming Bright Day" collection is a post-apocalyptic assortment of hand-carved/casted mewelry made using animal ephemera like bones, skin, and tails, which are much easier to chase when worn around your neck. New ish is arriving at Laced With Romance daily, including neckcessories like a black, diamond-studded baby alligator claw pendant cast in either silver, bronze, or gold, a bear tooth set in bronze and carved with a third eye, and a small neck pouch made of lamb & ostrich skin called the Black Mojo Bag, clearly stolen from Jack just before he made that movie where he's only allowed to smooch Kate Winslet like a 6yr-old boy. 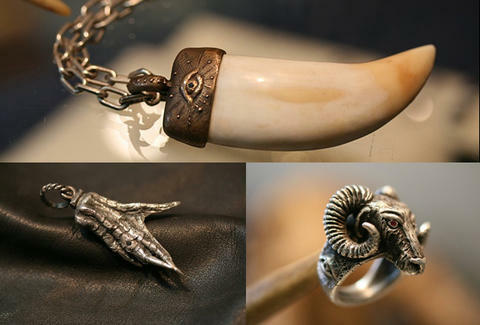 Handheld pieces include rings adorned with silver-cast rattlesnake tails, bronze carved anatomical cat skulls, Vikings, ruby-eyed rams, and headdressed Native Americans with exposed breasts, far more easily transportable than a furtively used National Geographic. Also on display at Laced is a collab with local milliner Joel Gammage: a top hat strewn with metal chains and the cast-bronze jaws of a fish, overall a look that could be pulled off by Slash, or really any hard Rockertansky.